iAntiVirus b3 has passed internal testing and is now available on Smart Update! This version includes a new scan engine, the ability to schedule quick scans, drag and drop scan support, the ability to enable or disable the dock icon and a variety of other enhancements and fixes. Please run Smart Update now to get beta 3 and let us know your thoughts on the iAntiVirus forum. 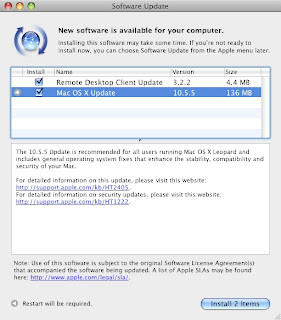 Apple has made a large set of security updates available on Software Update. If you haven't done so already, please update - it helps keep your Mac secure! 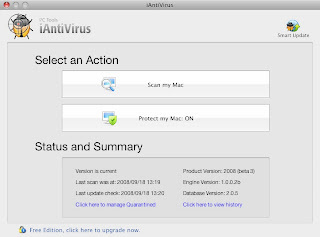 Sorry for the lack of updates recently, we've been busy working on the next version of iAntiVirus! The next beta is currently being put through it's paces by our QA team and should be confirmed ready for public release shortly. Please check back occasionally as updates of progress will be posted here first.